Chaabi is a genre of popular Algerian music that arose out of a felicitous melding of Berber melodies, religious chants and Andalusian tunes. Looked down upon for decades as an unworthy bastardization suited only to the lower classes, it began to find legitimacy in the 1930s under the inspired tutelage of El Hadj M’Hamed El Anka, who founded a conservatory to train young men (chaabi in its early days was performed exclusively by men) as professional musicians. Bousbia’s interest was sparked in 2004 when she went into Mohamed Ferkioui’s small antique shop in Algiers to buy a mirror, and came away with a wealth of stories about El Anka’s conservatory, which Ferkioui attended. Over the ensuing years, an architecture student in Ireland, traced all of El Anka’s students still alive, most scattered around Algiers or residing in Paris and Marseille. Their stories reflect the mid-20th-century history of Algiers’ Casbah, a warren of alleyways that for centuries was home to the city’s working class, mainly Muslims and Jews. 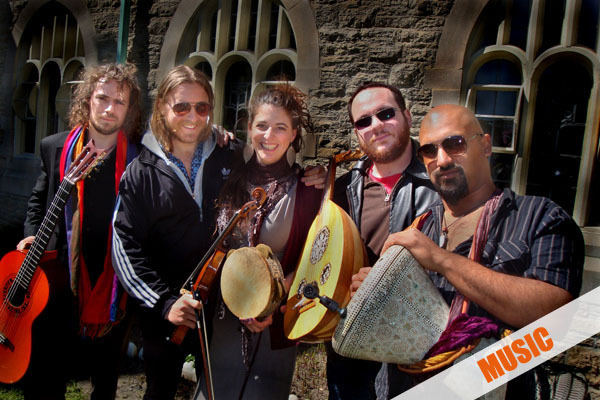 Ventanas is a Toronto-based urban folk band that draws musical inspiration from the diverse cultural backgrounds of its members. From Spain to Turkey, Ventanas explores many musical forms and languages from flamenco palos to Balkan rhythms, from Sephadic diaspora to Hutsul Ukraine.